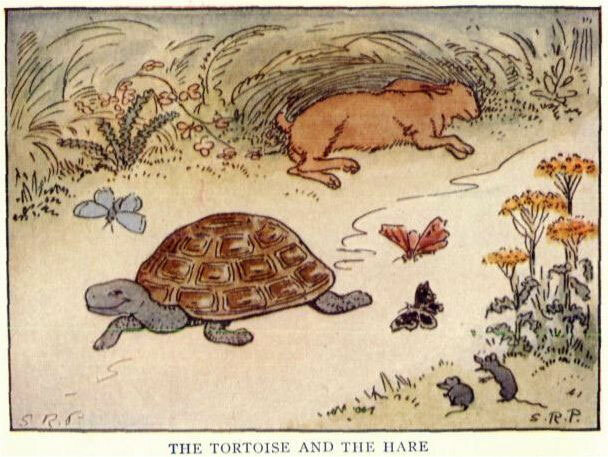 The story of the tortoise and the Hare, a fable from Aesop, is one of the most famous stories in the world. Perry Index numbers it as 226. This is an account of a race between two unequal opponents. The fable is subject to many, often conflicting interpretations. 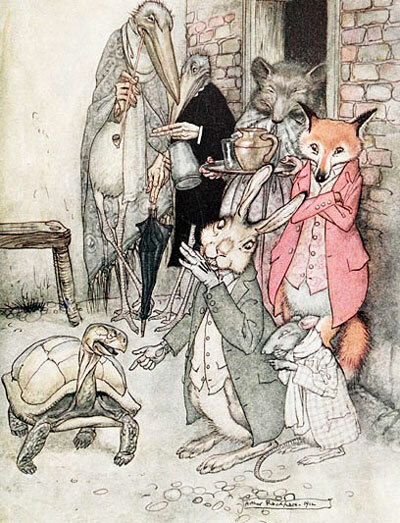 This is the story behind the famous adage,” Slow and steady wins the race” The fable is in fact a variant of a folk tale in which the clever tortoise makes use of ingenuity, deception and diligence, to overcome the overconfident hare. Once upon a time, there was a hare that was very swift and light on his feet. He was very proud of his speed. He was always boasting how he could beat anybody in a race. He was so boastful that other animals stopped paying attention to him. He used to tease the tortoise on his lack of speed. One day the tortoise decided enough was enough. He declared that in spite of his speed, he could still beat him in a race.. The hare couldn’t believe his ears. He declared that he was unbeatable and challenged the tortoise to a race. The tortoise accepted the hare’s offer. Illustration by: Arthur Rackham, “The Hare and the Tortoise”, illustration line block printed from drawing, from Aesop’s Fables. Published by Ballantyne & Co., London, 1912. A race was arranged. Naturally, the unusual race attracted a lot of attention. The next day found the hare and the tortoise at the starting line, in front of a cheering crowd. The race started. The tortoise started plodding forward. The hare laughed to see how slow his rival was. Being an inveterate show off, he yawned and lay down for a nap. After some time, the hare woke up from his nap. The tortoise had covered only one third of the distance. The hare decided that he had enough time for breakfast before catching up with the tortoise. Off he went to the nearest cabbage patch. He had a hearty breakfast. The heavy food and the hot sun made him feel drowsy. He saw that the tortoise was only half way through. The hare decided to have another nap. He fell asleep. When he woke up, sunset had almost set in. The tortoise was only a yard from the winning post. The Hare could only see him as a speck in the distance. The hare dashed forward in a great burst of speed. Lungs bursting, sinews stretching, he bounded forward. The final effort came a little too late. The tortoise was already at the winning post! He collapsed near the triumphant tortoise. Like all fables this has a moral. Perseverance always pays off in the end. It is the Hare’s foolish over-confidence that leads to his defeat. Many people have natural abilities which they ruin by overconfidence and plain idleness. Enthusiasm, sobriety and perseverance are the qualities that can make you a winner.